Waterfront condos in Boston offer you great views of the Boston Harbor, a relaxed atmosphere enhanced by large green spaces, while positioning you just a quick walk from the heart of downtown Boston. As a resident of Waterfront condos you are located near major streets for easy transportation, as well as the Green, Orange, and Blue Line T stations. Within the immediate surroundings of Waterfront condos you can enjoy the new Rose Kennedy Greenway and the Christopher Columbus Park that provide great spaces for kids to play or for picnics. The New England Aquarium is another great daytime, kid-friendly activity. Step out of the Waterfront condos and walk around the cobbled streets of the North End where you can sample the authentic Italian restaurants and cafes that serve up homemade pastas, rich cappuccinos, and fresh pastries. The area is also home to a variety of Italian groceries, wine shops, and bakeries, as well as retail boutiques and unique home decor stores. Past the North End, just a short walk further is Faneuil Hall Marketplace, full of shopping, dining, and late-night options. Handle your business and banking in the Financial District and Government Center, walk through to go shopping at Downtown Crossing, or relax in the Boston Common. 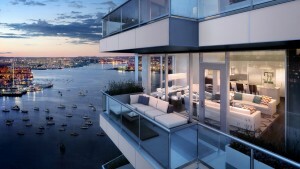 At night, you can return to the Waterfront condos for barge parties, hotel bars and lounges, and nightly events. Contact us at 617-356-7332 to speak about your Waterfront housing needs.